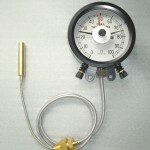 We are manufacturing Vapor pressure type thermometers and Liquid filling pressure type thermometers designed by the high-level technology and know-how at present after taking over the business affairs from Chino Instruments Co., Ltd. The products manufactured and inspected carefully in details under the design based on the long-time research and experience results and the perfect quality control have been used for important facilities such as power stations and sub-stations for a long time. The insides of the thermo-sensor cylinder, capillary, and Bourdon tube are filled with liquid which changes volume with varying temperature. 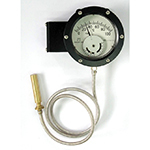 Since the displacement of the Bourdon tube due to an internal pressure change is directly indicated on the scale division plate, this product is excellent in vibration resistance.